This is the most pathetic excuse for a movie. If I could have given it half a star I would have. And the Executioner is the only reason for even that! Wesker's character was just another pathetic baddie for Alice to god-mode through. In fact, the entire series was a let down. 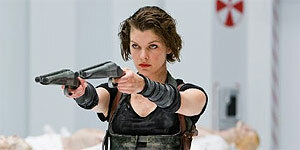 No one should be immune to the T-virus, and it makes Alice a superwoman? Fine, fine, I'll accept that. But what the hell did they do to Wesker?!? He never had the T-virus, it was a custom he made himself, and he constantly had to take a serum to keep it controlled. So he would not have that little parasite he had in the end. And why was he beaten so easily?! And then Chris. Oh dear god, poor Chris. They scale his role down from main character to support for Ali Larter (who, in my honest opinion, plays the same goddamn character in every movie she's in), and they never even give him and Wesker their background! Where's the feel of betrayal? Where's the mounting confrontation? And why the hell does Chris not get the satisfaction of being the one to kill Wesker? !